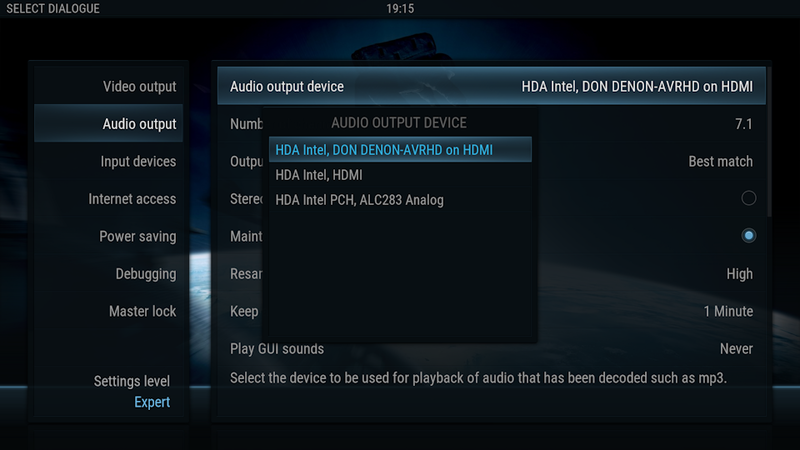 I have a Dolby ATMOS setup at home with an Intel NUC (with Openelec installed) and it's working fine. I've got a couple of ATMOS demos/trailers in mkv and they work fine. My receiver recognizes the audio track no problem. I've also got a Bluray ISO with an ATMOS track, but here I get no sound at all. I can play the standard 5.1 track from the same ISO no problem, only the TrueHD track is silent. So I "solved" it by converting the ISO to mkv with makemkv. I can now watch the movie with all it's ATMOS glory. I guess there's something weird with how Kodi handles the TrueHD track on Bluray ISO. Fyi. Kodi has no problem passing Atmos, Dolby TrueHD, DTS:X, DTS-HDMA or any other high bitrate audio from an ISO container. Are you using Wasapi setting to pass your audio through to your AVR? (2016-11-01, 16:12)brazen1 Wrote: [ -> ] Fyi. Kodi has no problem passing Atmos, Dolby TrueHD, DTS:X, DTS-HDMA or any other high bitrate audio from an ISO container. These are the only choices I have in regards to output. None of them work (same when choosing "passthrough" device). But should this even make a difference, as it works on MKV-files where TrueHD audio is used?